Butter is fantastic. Whether baked into biscuits, spread on toast or burnt into sticky caramel, butter is a faithful friend and, truth be told, us humans get through it at a rate of knots. Did you know that you can make 100% pure, delicious butter from cream in minutes with a jam jar, some cream and your own arms? Well, you can. 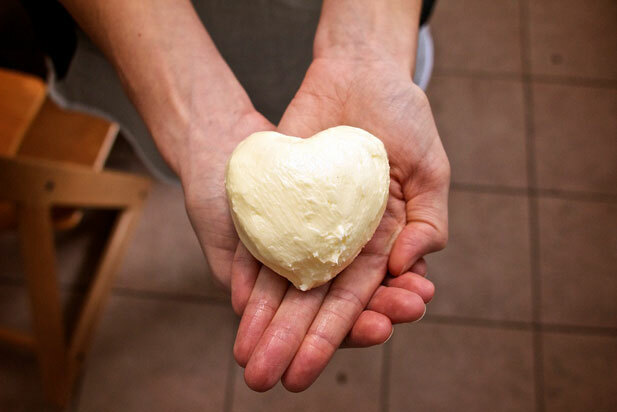 The science behind butter churning in a nutshell – agitating cream breaks the fragile membranes surrounding milk fat particles, which causes them to clump together and form butter, with buttermilk as a byproduct. 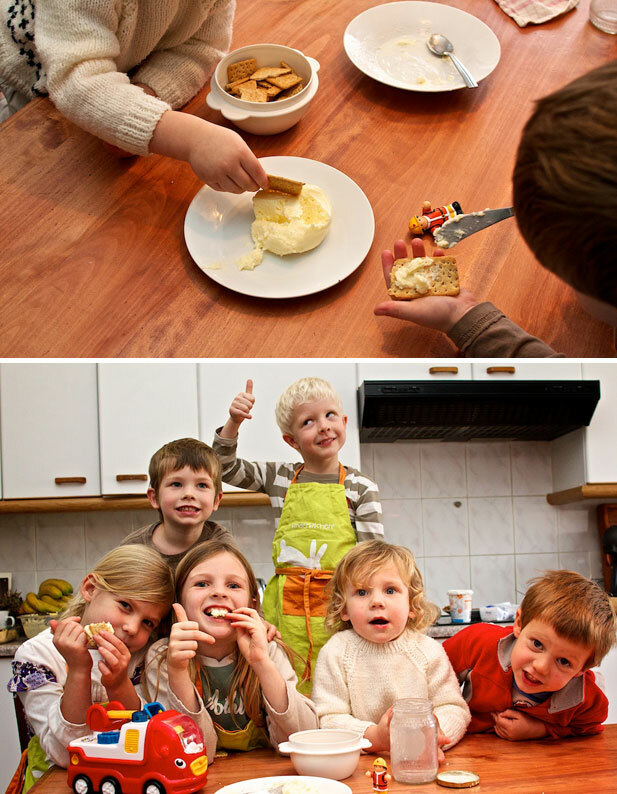 We put some mini chefs through their inaugural butter-making paces, and there were bright eyes all round as the cream morphed magically into butter after about five minutes of shaking. 1. 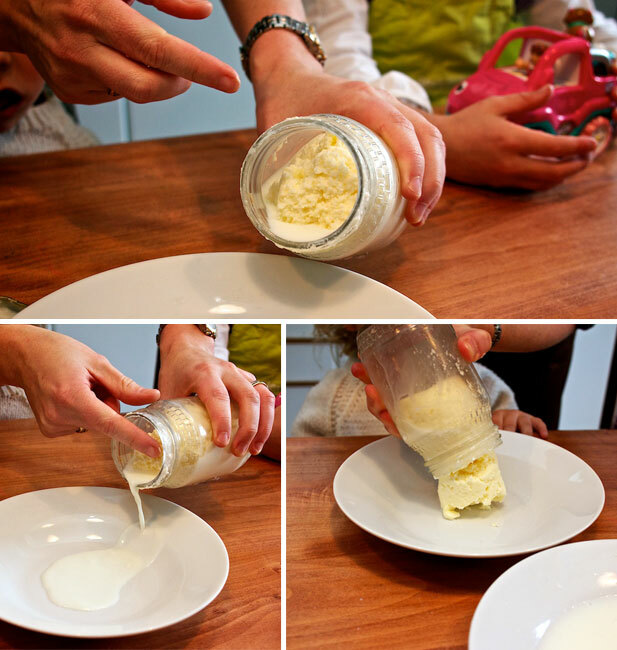 Pour your cream into the jar and close the lid tightly. 2. 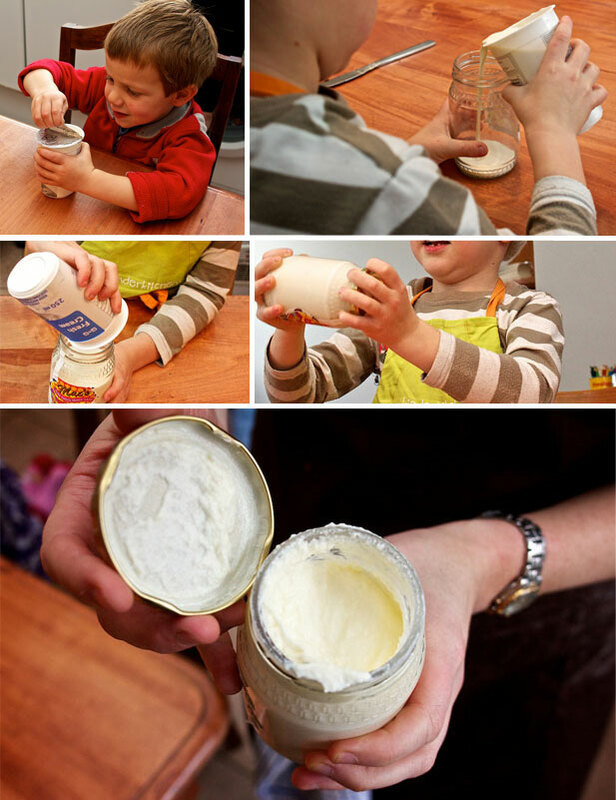 Hold the jar in two hands and churn the cream by hand with short, sharp shakes (one per second). After 5-10 minutes, you’ll notice the consistency changing and thickening. 3. 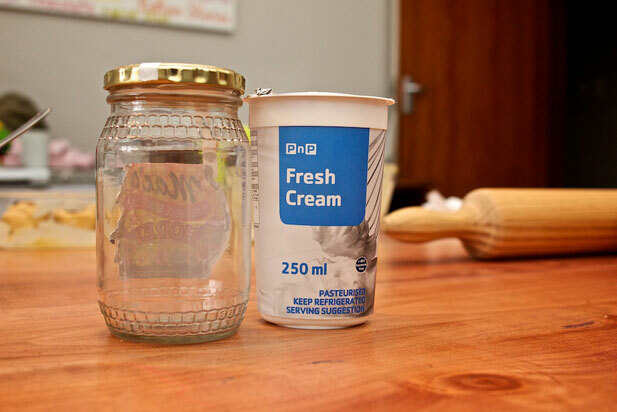 Keep shaking until you feel the butter ‘thunk’ inside the jar, and the butter and buttermilk have visably separated. 4. Open the lid and drain the buttermilk into a bowl. 5. Rinse your butter by adding some cold water to the jar and swilling it gently. Discard the liquid, and repeat this rinsing process until the water drains clear – then turn out your butter onto a clean plate. 4. Agitating the butter at this point, releases any lingering buttermilk, which is a good idea. This can be done by gentle presses with clean, bare hands or wrapping the butter inside a piece of clean cotton and wringing it or stirring it with a spoon. 5. If you’d like to make salted butter, mix in a 1/2 teaspoon of table salt (you might need to drain it again afterwards). Look out for the next Minichefs post, in which we learn how to make sticky cinnamon buns (and thanks to supermom Taryn for inspiring this particular butter adventure).